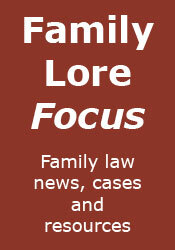 Family Lore: Whatever happened to... Family Law News? ... the first issue of the Law Society's Family Law News. Intended "to provide up-to-date information on proposed Government reforms but also discussion of and advice on current practice issues", the newsletter subsequently disappeared in the mists of time. I do recall it being quite useful while it was going, but I don't recall its passing. Incidentally, the cartoon bottom left brought back some horrific legal aid memories. It reads: "Yes, all our solicitors are highly specialised. We have one on the Children Panel, another is a trained mediator... ... but the one we are most proud of is David... ... he's one of the few people in the country who can understand the new legal aid forms."